Small Size: 1.30" X 1.28" X 0.313"
With safety in mind, current is delayed and slowly ramped for maximum protection supplying up to 2.2 A of current to your laser diode from a single + 5V power source. An internal thermostat shuts down the WLD safely if the device temperature exceeds 105°C. Remotely enable or disable current. Zero leakage current allows operation with VCSELs. Current range is scaled by an external resistor. To operate from 3.6 V (for Lithium-Ion batteries) try the WLD3343HB. 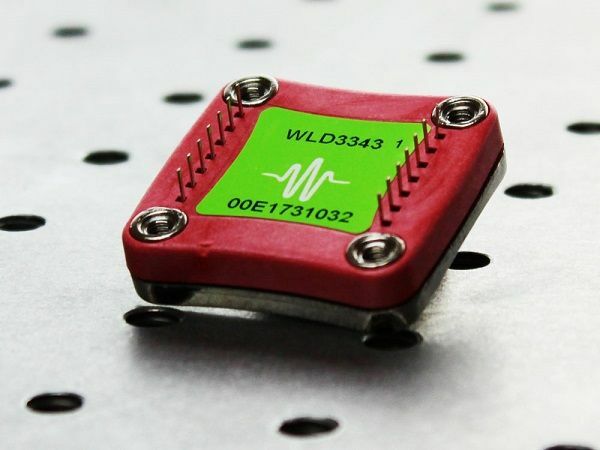 For 3 A operation, the WLD3343-3A is available. To drive with lower noise in Constant Current Mode only, the WLD3343-2L and WLD3343-3L drive up to 2 A and 3 A respectively. A circuit calculator tool speeds selection of external component values (see Design Tools tab). 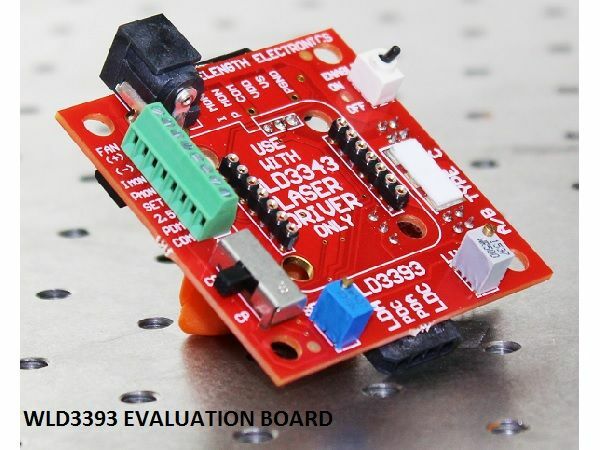 An evaluation board is available to simplify prototyping: WLD3393. Heatsinking solutions to use the WLD3343 at full current are available. This laser diode driver is ideal for applications where space is tight. It is widely used in electro-optic qualification, raman spectroscopy, medical diagnostic equipment, range finders, and on research benches.